It was another quiet night, with the exception of various arrests around Belmont and Sheffield. A "suspicious person" call brought police to Belmont and Racine, where the "suspicious person" was found to be wanted and taken into custody. All in all, though, we've enjoyed fairly quiet streets during the recent cold snap. The weekend's bringing warmer weather, which may draw out the troublemakers. Things didn't end smoothly for a man who "recently met" another man and invited him over to his apartment in the 800 block of Cornelia this morning. When it came time to go, the host called 911 to report that his new friend wouldn't leave and had begun "attacking" him in the bedroom. There was one more problem. The bedroom door would not open. At the same time, the caller said he did not want the apartment and bedroom doors forced open, so the "attack" must have been pretty mild. Officers who waited outside of the apartment could not hear any indications of trouble. Finally, at 5:55AM, with the visitor finally agreeing to leave, 911 received the caller's permission to have his apartment doors broken down. The front and bedrooms doors were quickly breached, sending the "guest" scurrying away. Version 1.0 (left): A CWBer saw a fellow passenger equipped with one of these on the CTA last night. Very impressive. 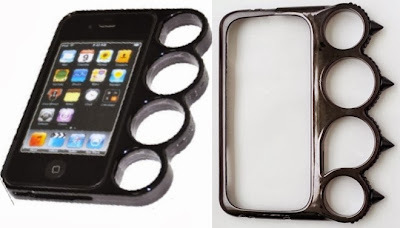 Too bad the case is made of plastic. Version 2.0 (right): Still plastic, but definitely a step in the right direction. There are a ton of options on Etsy. We love the way this is going, but we'll wait for more substantial materials before buying. Ah, yes. Flip phones. Here's a decent laugh. Very retro. Back from the days when a "thief" was expected to go for the victim's wallet instead of his phone. Maybe we should all get flip phones again.